Notice that this graph is indeed a tree since $\mid V(G) \mid = \mid E(G) \mid - 1$ (5 elements/vertices and 4 bonds/edges). The valency of an element refers to how many bonds that element can have. For example, the valency of carbon is $1$ since carbon has only $4$ electrons and can accept $4$ more electrons for a full $8$ electron orbital. Note that in these molecular structures, the valency of each element is equal to the degree of that element. For example, since carbon has a valency of $4$, the degree of any carbon atom will always be $4$. The chart below lists some common elements found in trees and their valencies. 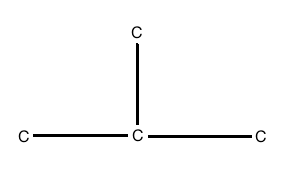 Show that the chemical molecule C2H6 is a tree structure. Since $\mid V(G) \mid = 8$ and $\mid E(G) \mid = 7$, then $\mid V(G) \mid = \mid E(G) \mid - 1$, and by equivalence, a graph $G$ representing the molecule C2H6 is a tree. In chemistry, an isomer of a molecule is another molecule that has the same chemical formula but a different structure. We can evaluate the number of isomers of a molecular formula using graphs. Remark: The term "isomer" is not the same as the term "isomorphic" which we defined earlier. Isomers have the same molecular formula, while isomorphisms have the same graphical structure. Draw all of the isomers for the molecule C4H10. So there are exactly $2$ isomers of C4H10. We will omit the structural formula for these isomers as they can easily be obtained by taking the two trees from above and adding hydrogens around the carbon backbone until the valency of each carbon is $4$.